Back to planted after 4 years. 3ft with plants like anubias, java ferns, vals, tennellus, nana petite, crypt wendtii green & tropica. Not decided on what fauna to keep but was considering a school of lamb chops, dwarf cories and shrimps. With these plants, not adding co2. Weekly dosing will be lushgro ferts. Updated pics and also a..... baby chocolate gourami! Last edited by elimmel; 13-06-2018 at 03:02 PM. Very natural set up.. easy to maintain? Can share the media you're using for your tank? Just sand? Weekly 30% water change and tank wipe down. Dose twice a week with Lushgro products. Only front is ADA sand. The rest ADA aquasoil. 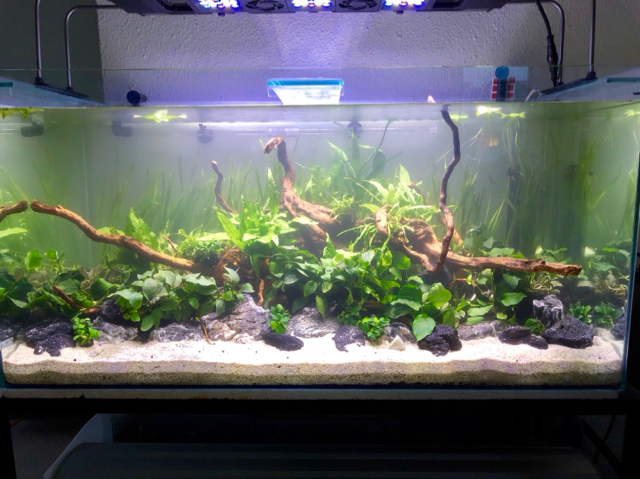 Nice scape bro, very natural looking!